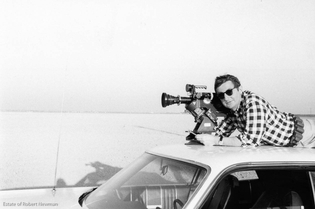 Robert Newman (1930-2007) was a producer and director of socially observant documentary films. Although his subjects varied widely – from a religious community in Scotland to civil rights workers in the American South to a senatorial campaign in New England – a common theme in Newman’s films is the struggle of individuals to deal with rapidly changing societies. From the early 1960s through the late 1970s, Newman documented a period of fast-moving social upheaval. Newman’s films won many awards. “City of Necessity” received the Golden Gate Award (grand prize) at the San Francisco Film Festival. “5 1/2” won the UNESCO Colloquium Award at the Mannheim Film Festival. The Edinburgh International Film Festival screened most films collected here, as did other international film events. Although Newman produced all his films on small budgets, he worked with well-known filmmakers and photographers, including Albert Maysles, Bernard Mayes, and Harvey Lloyd. His longtime filmmaking partners included Bennie Stromberg, Doug Magee, and Robert Farren. For most of Newman’s career, he produced and directed films for the now-defunct United Church Board for Homeland Ministries, where he also served as secretary for church and culture. He also co-wrote two children’s books, co-owned an art gallery, and studied literature and law. The Filthy Rich: Who Is Cleaning Up? Keywords: 1960, Religion, ecumenical, Christian, Iona Community, Iona Abbey,Iona, Judaism, UK, Scotland, Govan, Mull, Argyll and Bute, George Macleod.